Sales activity seems to be the single metric most high(er) volume sales organizations focus on. Despite all the attention, I think its one of the concepts thats most misunderstood. The biggest misconception around activity metrics is that the numbers in and of themselves mean anything. Without context around the numbers, they won’t be a very effective tool. In particular, activity volume numbers without a way to measure the effectiveness of those activites. If you’re going to focus your sales team on driving a particular number, then you should also be putting time into figuring out whether or not it’s working. If making 30 calls a day wasn’t working, and making 50 calls a day still isn’t working, then moving to 80 calls a day might not be the answer. At that point you should be looking for secondary metrics to give you insight into the effectiveness of those dials. Maybe the issue is that you’re calling into poor qulity leads, or maybe your current elevaor pitch needs to be fixed, or maybe you clients prospective clients prefer to be contacted by email? What happens as my sales people get better? Yes, they learn who to call, they learn how to ask for referrals, they figure out how to weed out the bad leads sooner. All of this leads to higher conversion rates, and your top people needing less activity than your new people or bottom people. Given that cold calling is every sales person’s least favorite activity, its not a surprise that the best always find a way to succeed on less cold calls. 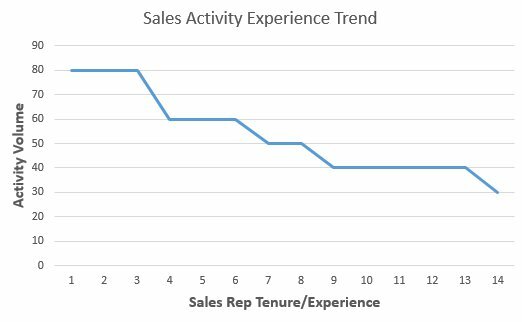 Sales Activity Experience Curve = as a sales person becomes more experienced, the number of activities they need to drive business tends to drop. 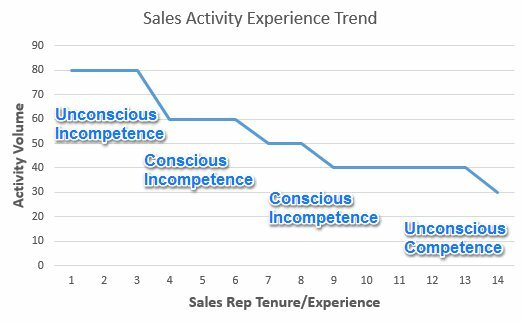 So why do so many sales organizations fight against this trend? The reality is because its easier to take a sledgehammer approach to sales activity, than to dig in and understand the effectiveness. Take some time to learn about the different stages of learning, and see if you notice this trend in your organization?